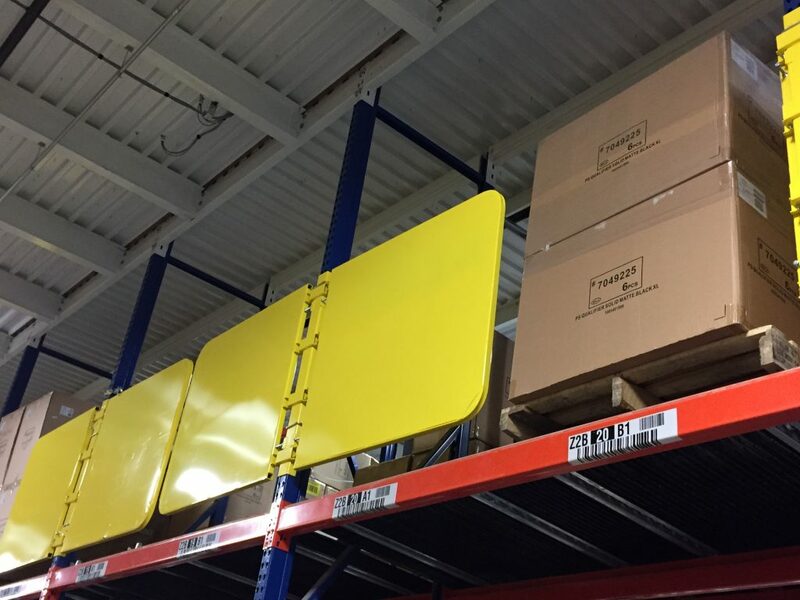 The Pallet Rack Gate automatically closes off the edge as the pallet clears the bay, protecting your employees. 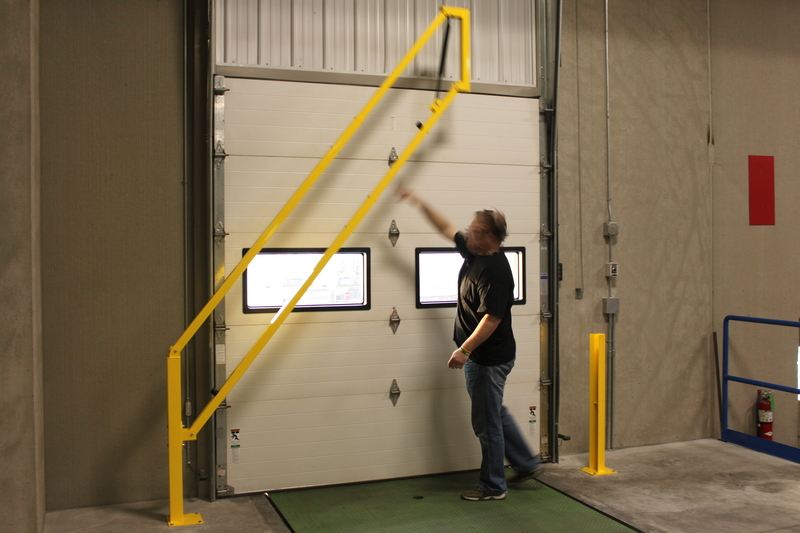 We’ve been adding a number of gates to our mezzanine gate collection over the past year. Today I’d like to take a minute to talk about another of our newly added gates: the Pallet Rack Gate. The Pallet Rack Gate System is a self-closing gate designed to improve the safety of your pick modules with pallet flow systems or pallet rack based mezzanines, and are designed to meet or exceed OSHA railing standard 1910.23(a)(2) with a 42” high gate and mid-rail. As the name implies, it is specifically designed to integrate with your existing pallet rack. 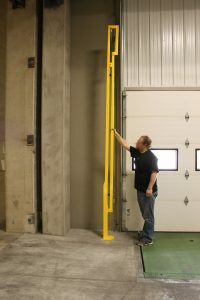 The universal hinge post brackets of the gate connect to the uprights of your pallet rack via U-bolts, minimizing the footprint of the gate, while allowing for an easy installation in minutes without the need for drilling. 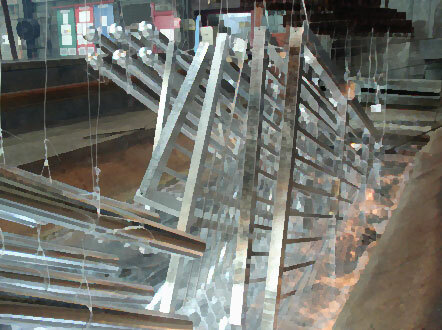 The gates are designed to fit standard 60” wide or 96” openings in your rack system, but custom sizes are available. If you need something special we’ll be happy to look into it. 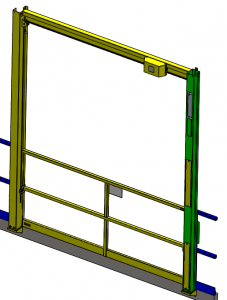 The intermediate sections of the Pallet Rack Gate system combine both a left and right gate on a shared hinge bracket, minimizing the cost. 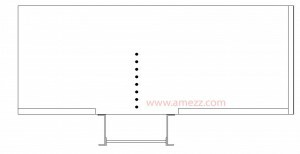 The gates are available as a single left gate with hinge bracket, a single right gate with hinge bracket, or if covering multiple connected bays of pallet rack, both a left and right gate connected to a shared hinge post bracket. 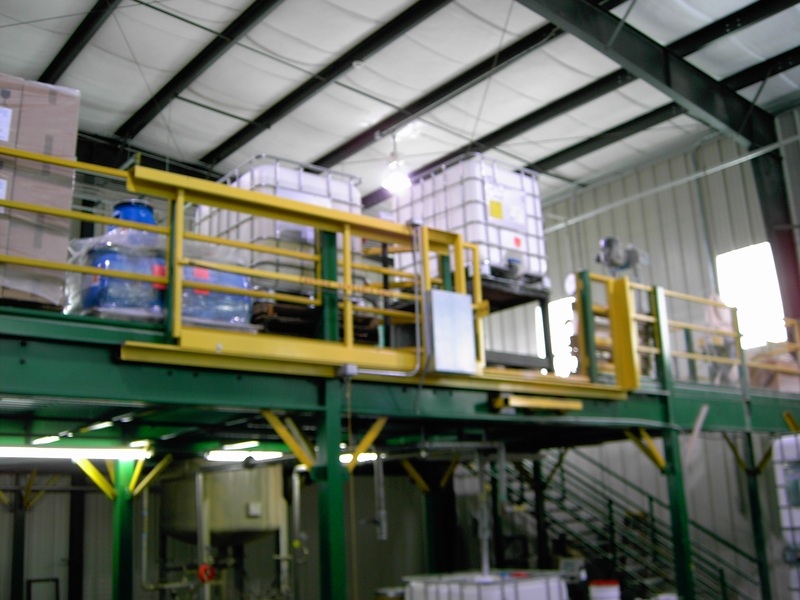 This helps keep the footprint and your costs down by minimizing the amount of material required. These gates are designed to stand up to the rigors of heavy use and require little to no maintenance. 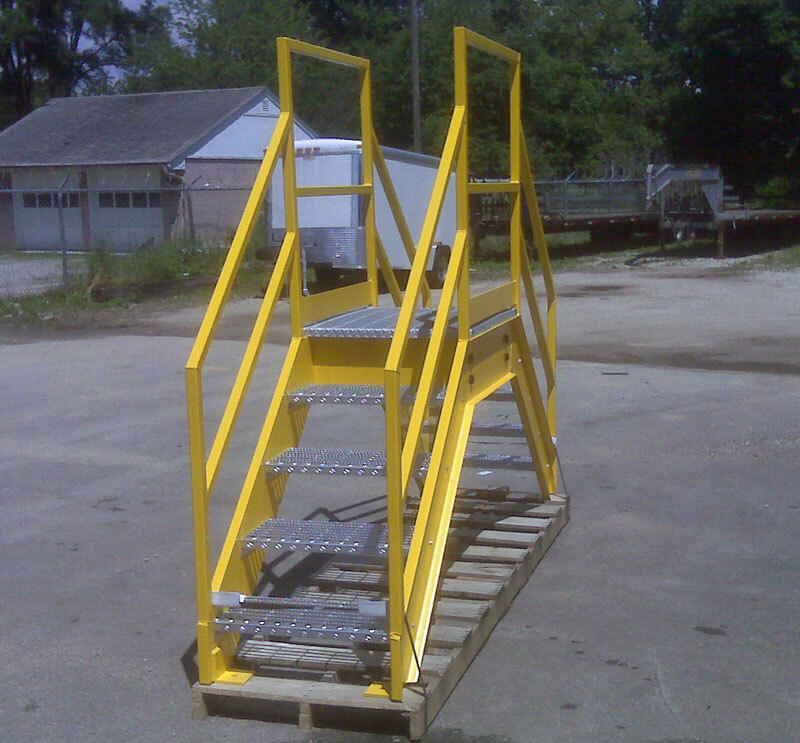 They are constructed out of durable mild steel and have a safety yellow powder coat finish baked on. 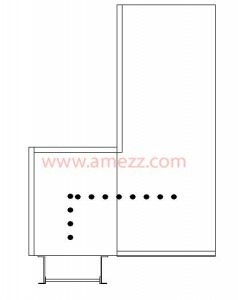 The four stainless steel torsion spring hinges connected to each gate assure a safe and reliable operation. 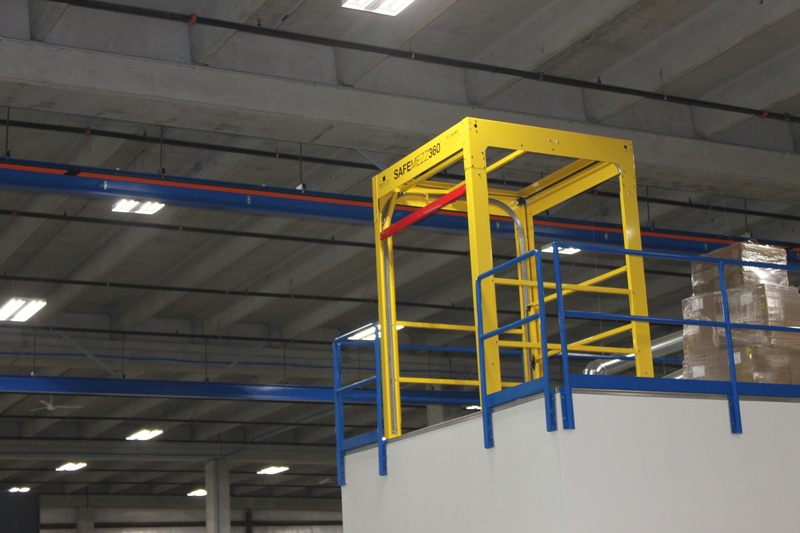 The Pallet Rack Gate System is a simple, durable, and cost effective method of increasing the safety on your existing pallet rack mezzanine systems and pick units. Give us a call and we’ll be happy to assist in laying out the design of the gates and working up a quote. 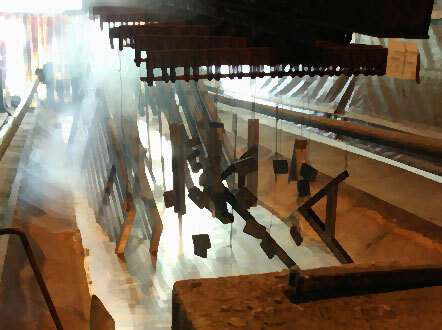 And if you’re looking to protect the base of your pallet rack from fork truck damage, or looking for a pallet rack itself, we’ll be happy to help with that as well. 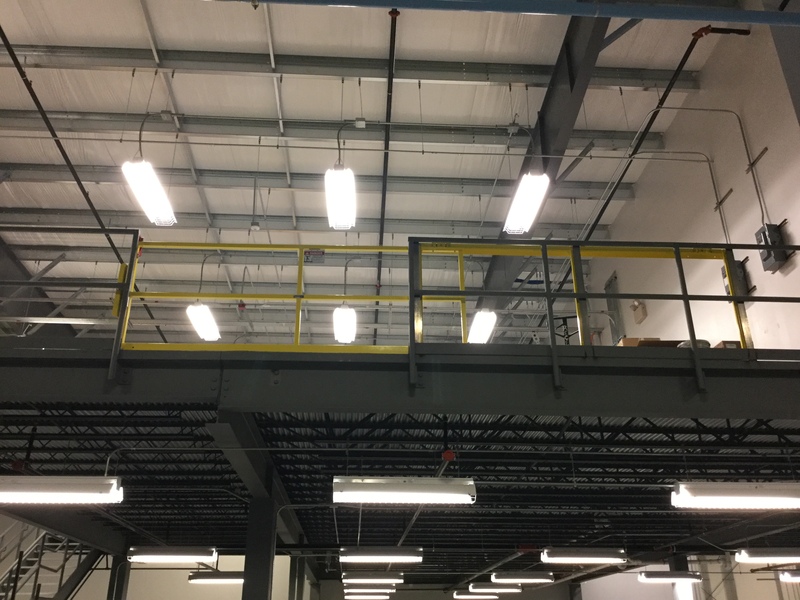 This entry was posted in Elevated structure, mezzanine gates, pallet rack, Safety Gates and tagged pallet rack, pallet rack gate, safety gate, self closing gate, self closing pallet rack gate on June 22, 2017 by Derick. 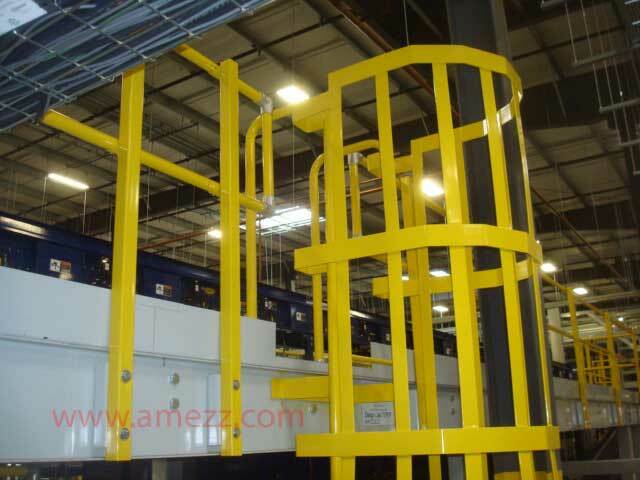 When discussing mezzanine gate projects, a number of customers seem to have some confusion as to what is meant by face mounting a mezzanine gate. I think in this post, I’ll go over the differences between deck mounting and face mounting and why you might want to mount your gate in such a way. 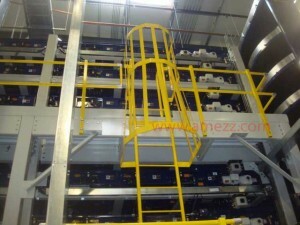 The vast majority of mezzanine gates are deck mounted. 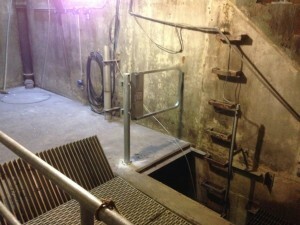 This means that the gate system sits on top of the mezzanine deck back behind the rail. 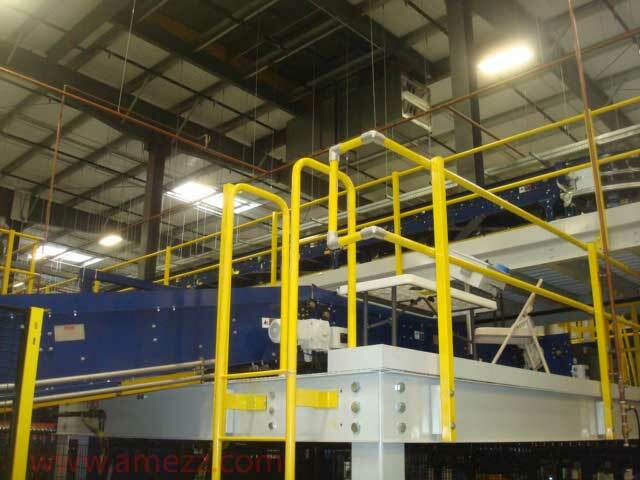 Below are a few examples of the various gates we offer mounted to the deck of the mezzanine. 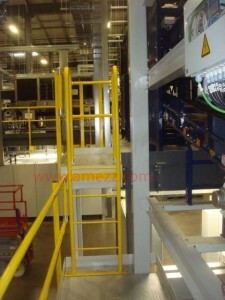 Deck mounted stainless steel vertical mezzanine gate. Occasionally though, the gate is being used in an unusual situation where setting the gate on top of the mezzanine is not an option. In these cases it might be better to mount the gate outside the mezzanine, attaching it to the face of the platform. We would call this situation face mounted. 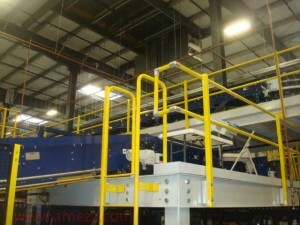 Not all of our mezzanine gates can be mounted to the face of the deck. 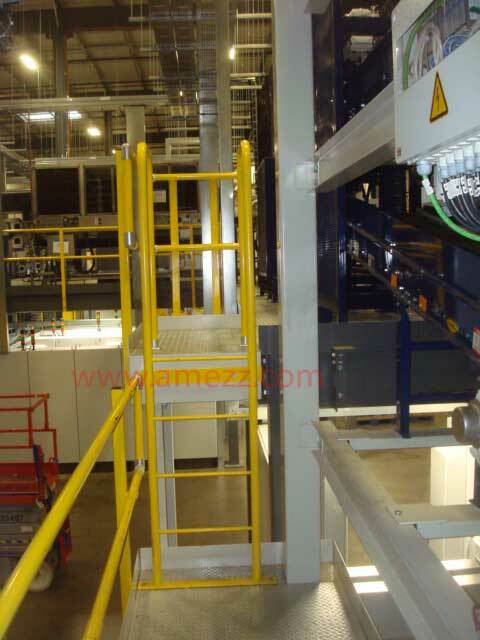 The most common gate that we would mount on the face of the mezzanine would be the horizontal sliding mezzanine gate. 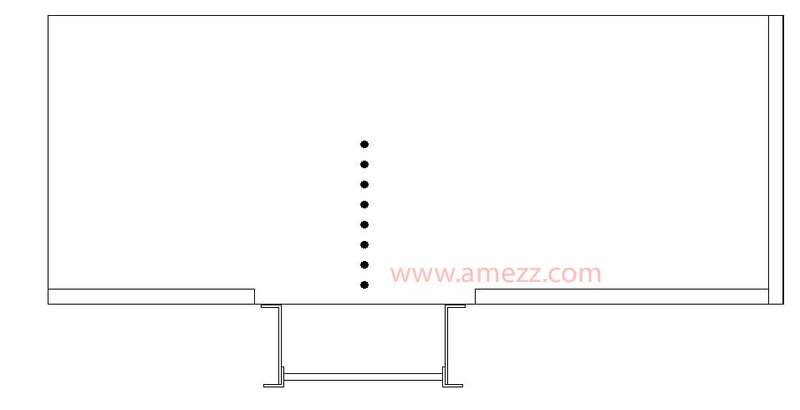 As the gate needs to be tied back to your existing railing with clear passage in one direction approximately the length of the opening size plus two feet, pulling the gate outside the deck could help avoid interference with existing equipment up on the mezzanine deck. 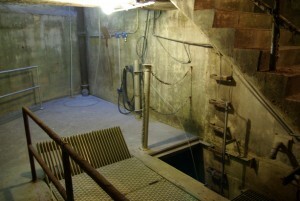 In this case, a face mount track would need to be added and attached to the face of the mezzanine just below the opening to support the gate. Another gate that can be mounted to the face of the mezzanine is the vertical mezzanine gate. 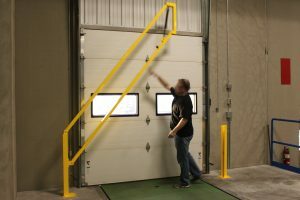 The vertical mezzanine gate doesn’t take up much room on the deck of a mezzanine, so the applications where you would want to face mount are a bit more specific. Most commonly, this is done in situations where we are mounting an electric vertical mezzanine gate on the outside of a wall opening. 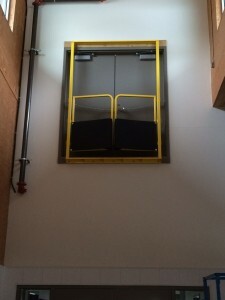 This would allow you to load and unload materials from the deck through a doorway while having a line of guard rail blocking the opening while the doors are open. Another situation where face mounting a vertical mezzanine gate might be advantageous, would be in situations where the left column (when viewed from below) would be against some obstruction such as a column. 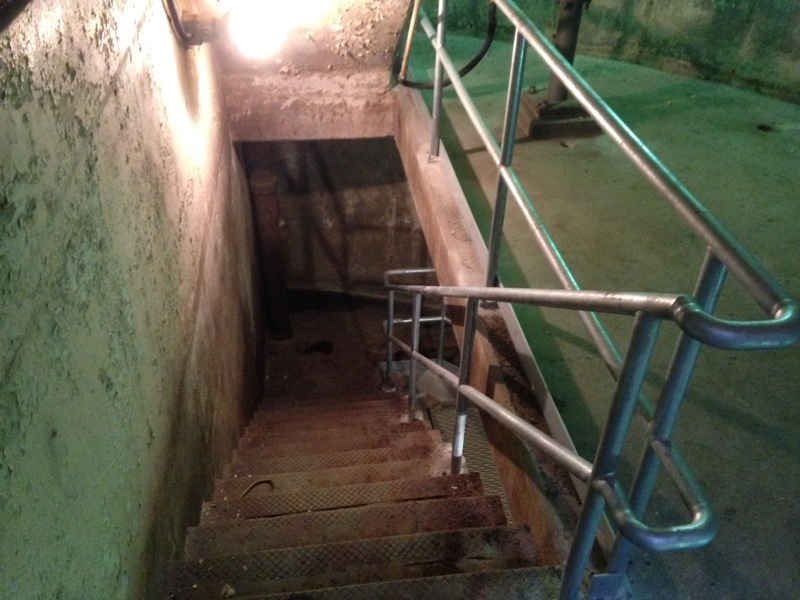 The left column is the drive column and you’ll want to have it unobstructed just in case you need to access it. By mounting the gate on the outside of the deck on a couple face mount brackets, the gate flips around placing the drive column on the right side. Face mounted self closing pallet gate being used to guard a second story doorway. Another gate that we can do as a face mounted unit would be the self closing pallet gate. 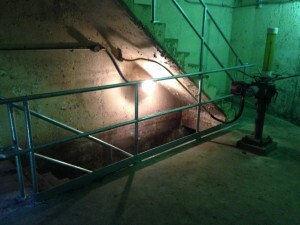 This is typically done in applications where the customer wants to mount the gate on a wall opening. 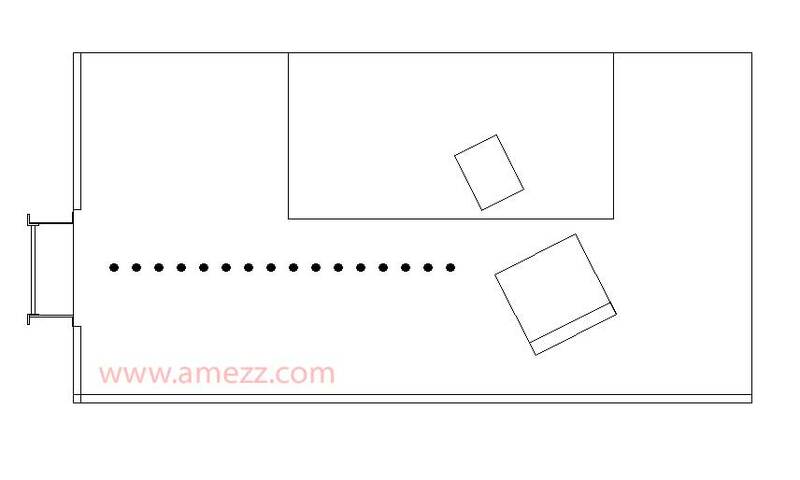 In such applications, we recommend you still have a second area for offloading the pallets from the deck. 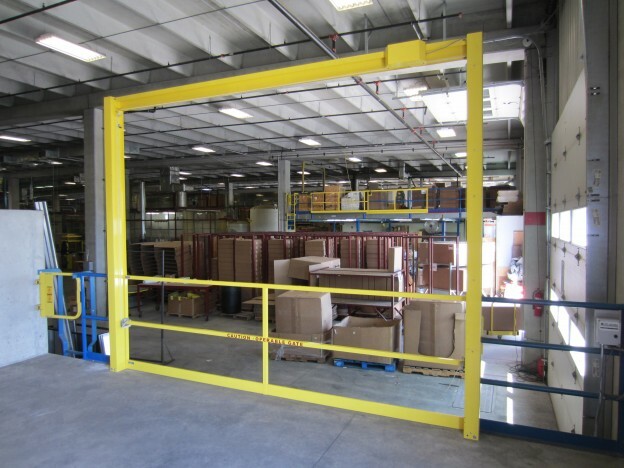 While the self closing pallet gate is incredibly efficient at getting materials up onto the deck, offloading materials from the deck can be cumbersome due to the spring loaded hinges wanting to keep the gate closed. 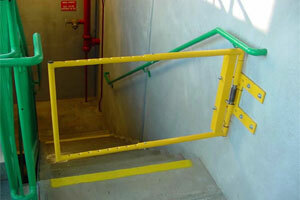 If you ‘re trying to mount a gate in an unusual situation, perhaps mounting it to the face of the deck might help. 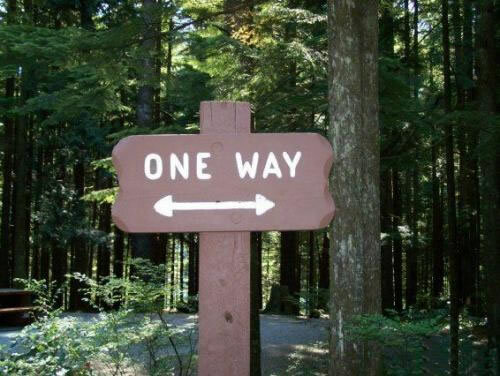 Give us a call, and we’ll be happy to work with you to try and find a solution. 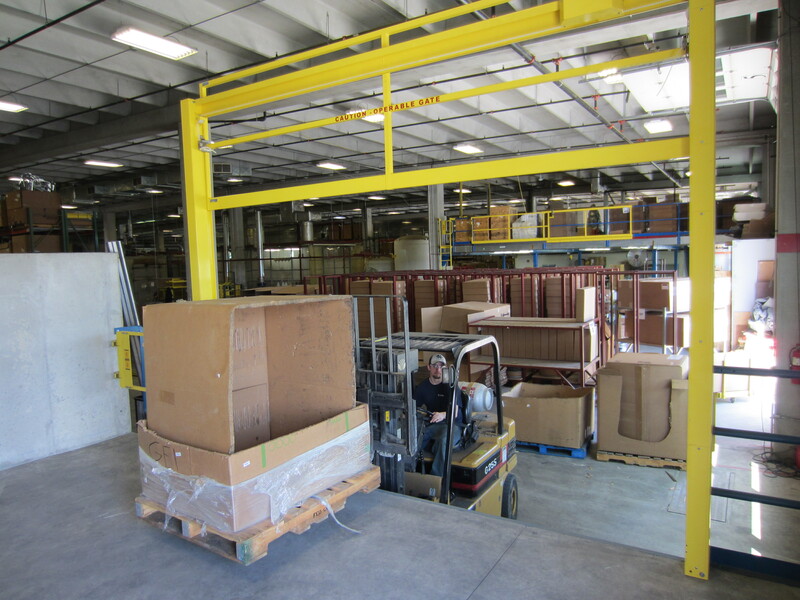 This entry was posted in mezzanine gates, Safety Gates and tagged deck mount, face mount, face mounted gate, mezzanine gate, pallet gate, wall mount on December 13, 2016 by Derick. 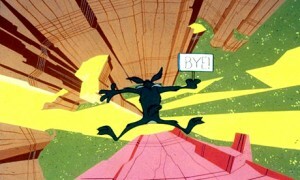 It’s an exciting time over in our mezzanine gate division. 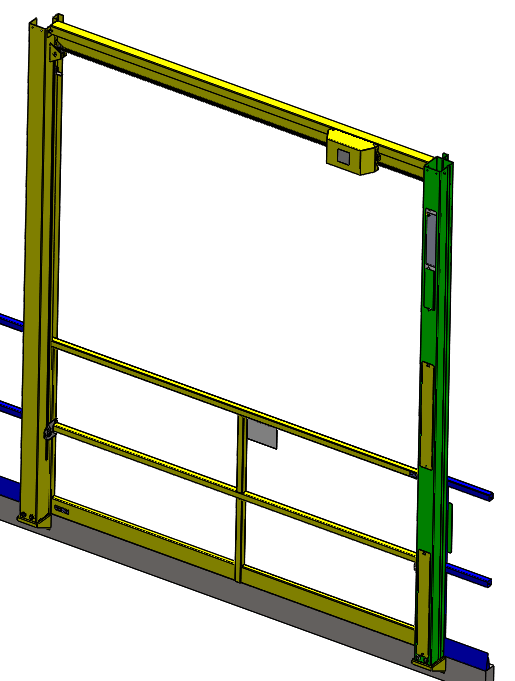 Over the next year we will be introducing several new gates to our product line. Today, I have the pleasure of introducing the first new gate to our regular product line up; the SafeMezz 360 mezzanine safety gate. The SafeMezz360 mezzanine safety gate open to the edge. Lately many facilities are opting to follow the voluntary ANSI standards in their workplace. 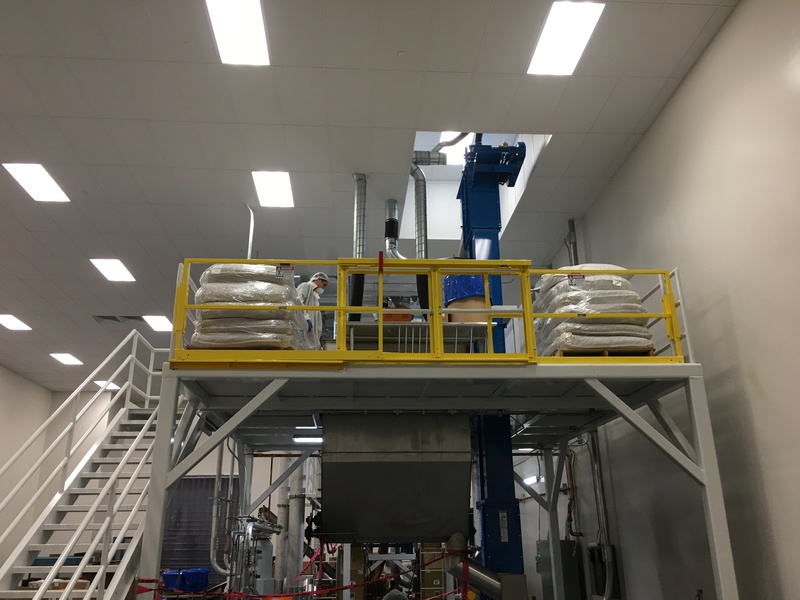 One area in which ANSI goes above and beyond OSHA would be ANSI MH28.3 Section 6.4.3 requirement that states: “A work platform shall be designed such that the elevated surface is protected by the guards at all times. 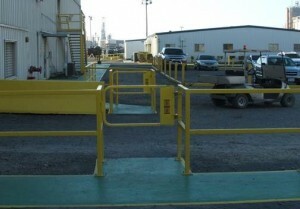 Gates that swing open, slide open or lift out, leaving an unprotected opening in the guarding, are not acceptable.” This means that at facilities following the ANSI standards, all pallet openings need to be protected by a true double layered safety gate so that your employees always have a line of guard rail between them and the edge of your deck. 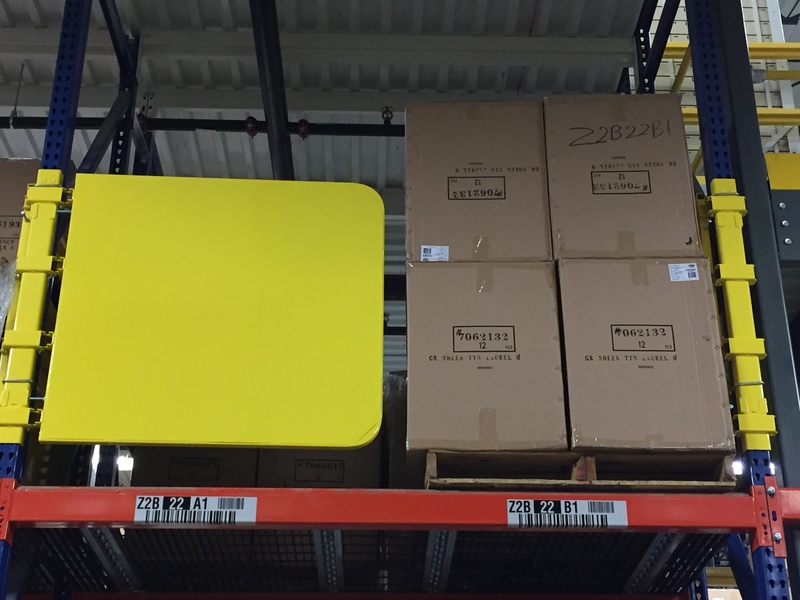 In order to meet these more stringent ANSI requirements, the SafeMezz360 gate utilizes two counter balanced gates which travel on a track up and over your pallets. 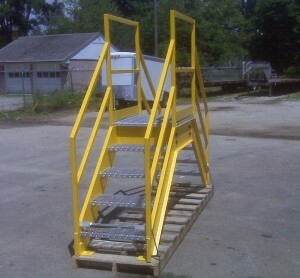 Each gate consists of the ANSI required 42” top rail, 21” mid rail, and 4” kick plate. 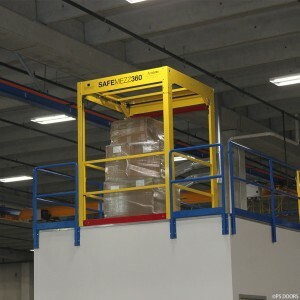 Designed for repetitive use in tough work environments, the SafeMezz 360 is constructed from heavy gauge steel with a durable safety yellow powder coat finish and utilizes an industrial duty chain and sprocket operating system. 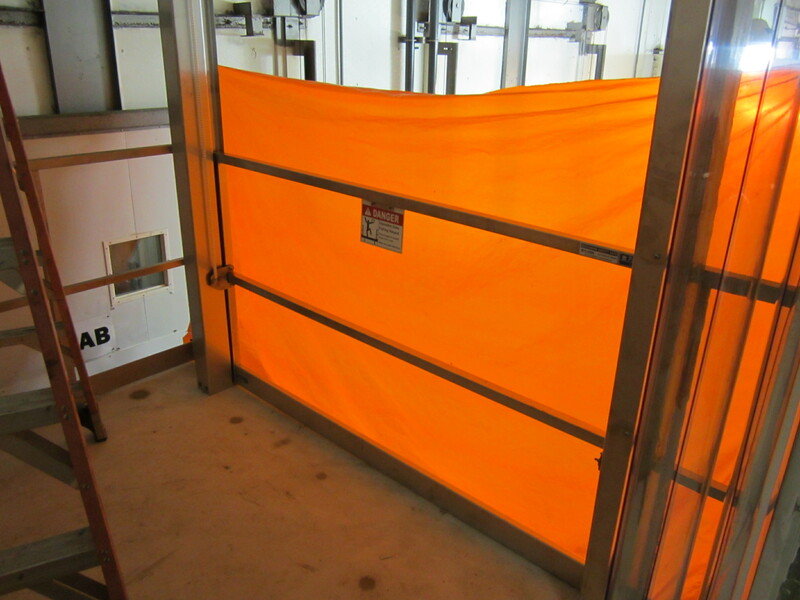 The SafeMezz 360 mezzanine safety gate also features a slam proof cushioned dampening system to keep the gate from dropping on your toes. 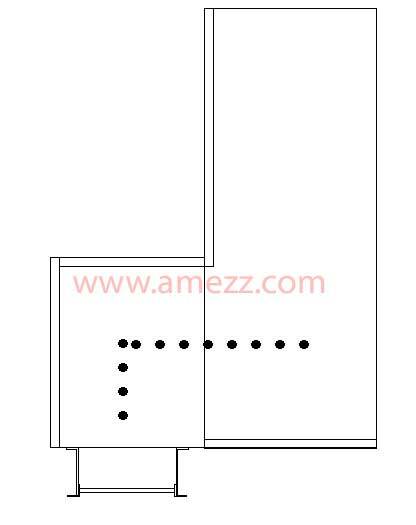 The SafeMezz 360 is easy to install and operate. 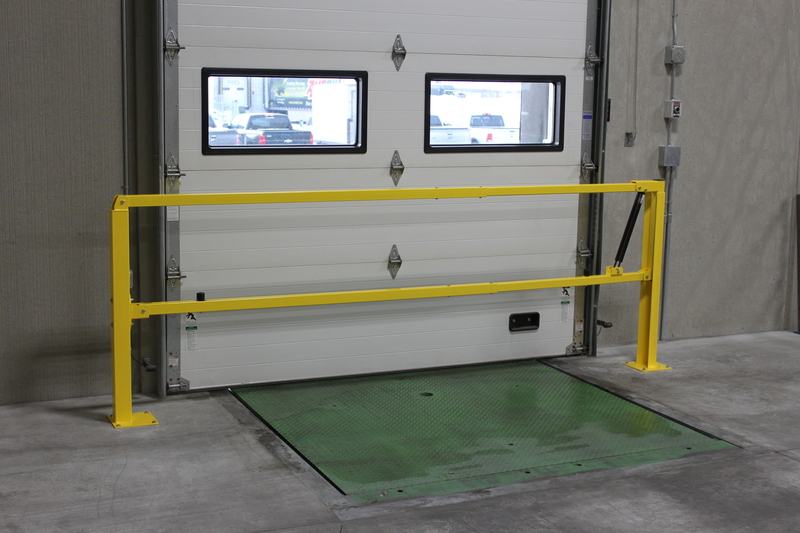 The gates travel smoothly on 2” nylon rollers along it’s track system providing for an easy one-handed operation. The gate ships in knocked down form for a simple assembly in the field, and bolts easily into place on the mezzanine. 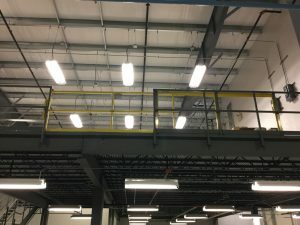 In order to minimize the lead times, we have single and double wide openings available as “quick ship” mezzanine safety gates. 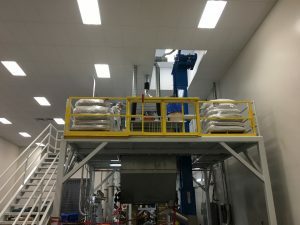 This means that many of the components will be prefabricated and stocked at the factory so that your gate should be ready to ship out in 1-2 weeks. 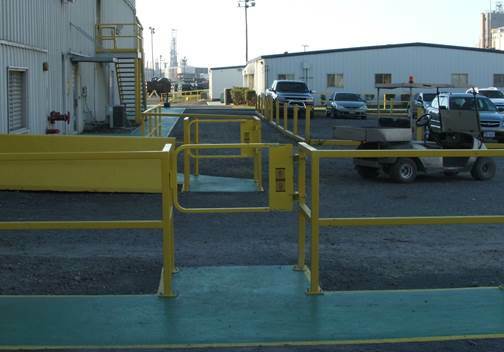 Custom sized safety gates will still be available, but will need to go through full production (typically around 6 seeks after signed approval drawings). 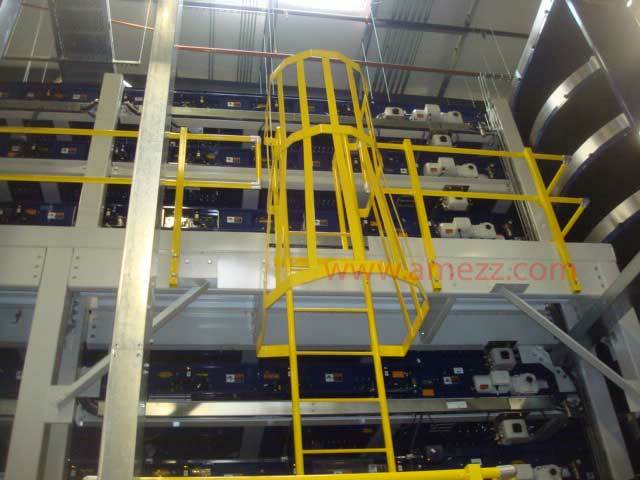 This entry was posted in mezzanine gates, Safety Gates and tagged mezzaine safety gate, mezzanine gate, pallet gate, SafeMezz360, safety gate on May 6, 2016 by Derick.